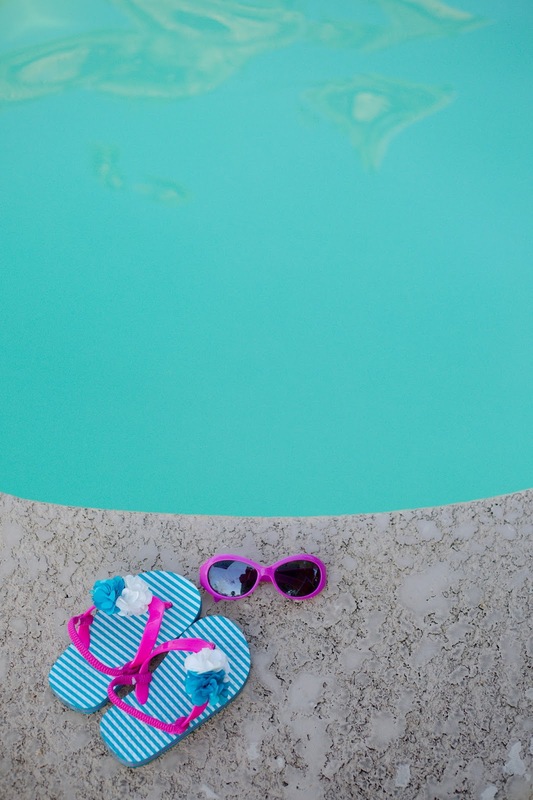 One of the best things about summer is all the trips to the pool! Our apartment community has two different pools, and we go as often as we possibly can. 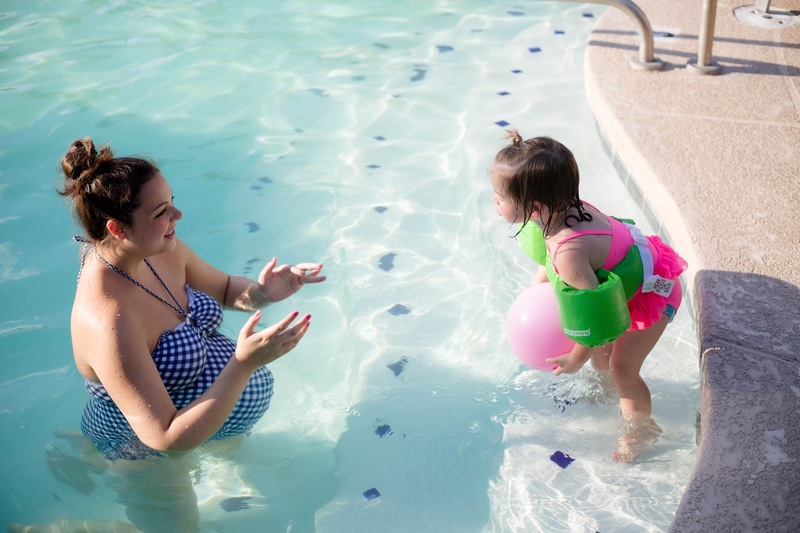 Feeling weightless as I float in the water is the BEST for this pregnant mama, and Claire loves the pool too. I've received a few comments lately on my snapchat (@brookejanette) about how much Claire loves the pool, and questions about how I got her to be so comfortable in the water. She was NOT a water baby when she was first born (she would scream even during baths! ), but I've been trying to teach her that the pool is a really fun and safe place to be. 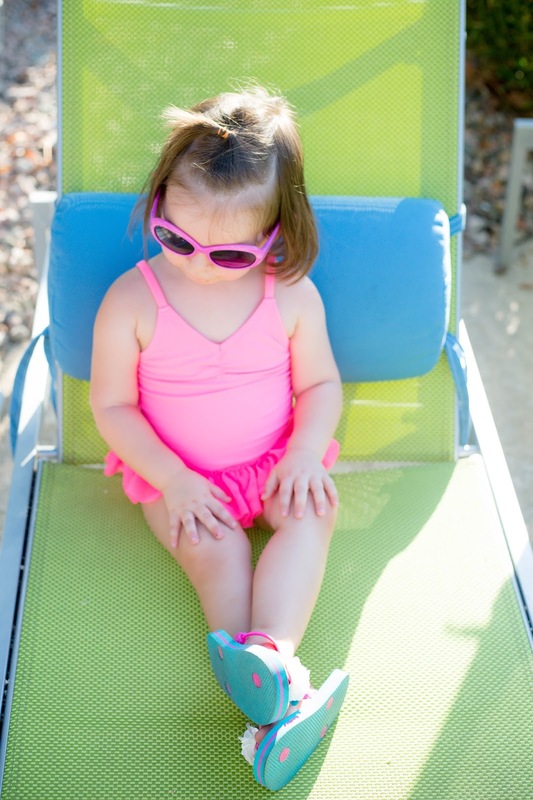 Now she asks to go swimming almost every day - and it's saying no on some days that's the hard part. When we first moved in, I took a few minutes to ask management questions to make sure the pool was safe and fenced off with auto-closing and locking gates. Claire and I also talk a lot about the rules of swimming before we go - she knows she can't go in the water unless mommy or daddy is with her. We also use a floatie that she loves (ours is US Coast Guard approved, which I love!). It's never too early to teach your children that water is fun! When they're super little, this might just mean splashing and playing in the bath tub. 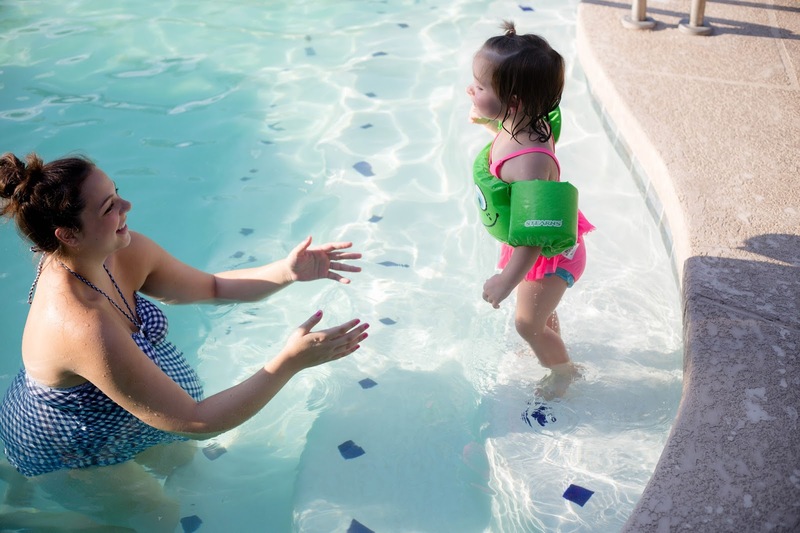 But most babies love to be cuddled and walked around in the pool when they're super little - as long as their fragile skin doesn't get too much sun! Once, at a playdate, I watched a toddler take a little tumble off a ramp (he was totally fine). At the same time as I gasped, "Oh no! Are you okay?!" his mom said, "Whoa! Cool trick!" It taught me a lot about reacting positively and not stressing over every little thing. Now, at the pool, if Claire accidentally dunks her head, I say, "You did a bob!" instead of "Oh no! Are you okay?!" 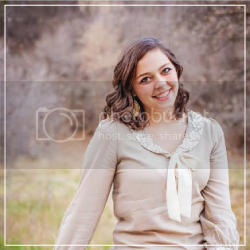 and I try to laugh instead of scream if I get unexpectedly splashed. 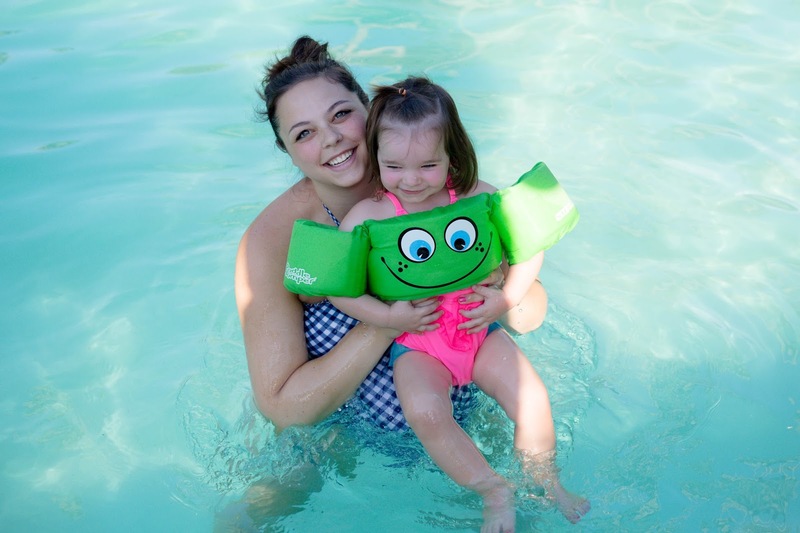 Maybe it seems like a small thing, but it really helps Claire have fun at the pool instead of learning to be scared or apprehensive. We love to bring an inflatable ball the pool, and practice throwing, catching, and swimming to get it. Claire also loves to jump off the edge into my arms, or practice swimming "all by self" from my arms to the pool steps. She likes to zoom around and practice floating on her back - while pretending to be a fish, of course. Simple and fun games like this make the pool so much fun! Every time we go to a splash pad, Claire needs about twenty minutes to just sit and watch the other kids play before she works up the courage to play herself. Isn't it funny how, even when kids are so little, they do NOT like to be forced to do anything? Sometimes you just need to model the fun for a bit, and then they'll work their way to joining in! We have a go-to pool bag that's always ready to grab. It has towels, water bottles, snacks, a pool toy or two, and a coverup for Claire in case she needs to get out of the sun and no shade is available. (In theory our bag has sunscreen too, but we're not really a sunscreen family? I think we have a bottle of it somewhere...) We also have LOTS of Huggies Little Swimmers swim pants and lots of Huggies Natural Care Wipes. Whoever invented the side tear-aways on swim pants is a genius - it makes getting wet swim pants off so easy! Plus, these ones have fun Disney•Pixar Finding Dory characters on them. We also love the Triple Clean Layers on the wipes that are perfect for messy snack fingers. 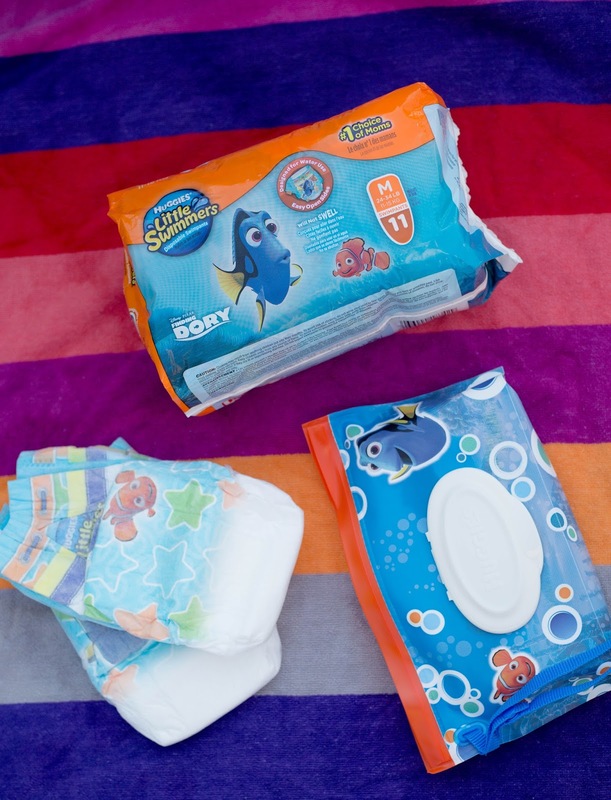 For worry-free water fun in the sun, look for Huggies Little Swimmers with new Disney•Pixar Finding Dory characters at a retailer near you, and follow this link to download a coupon for $1.50 off your first pack of Huggies Little Swimmers – for a limited time – and find other Huggies offers. What would you add? 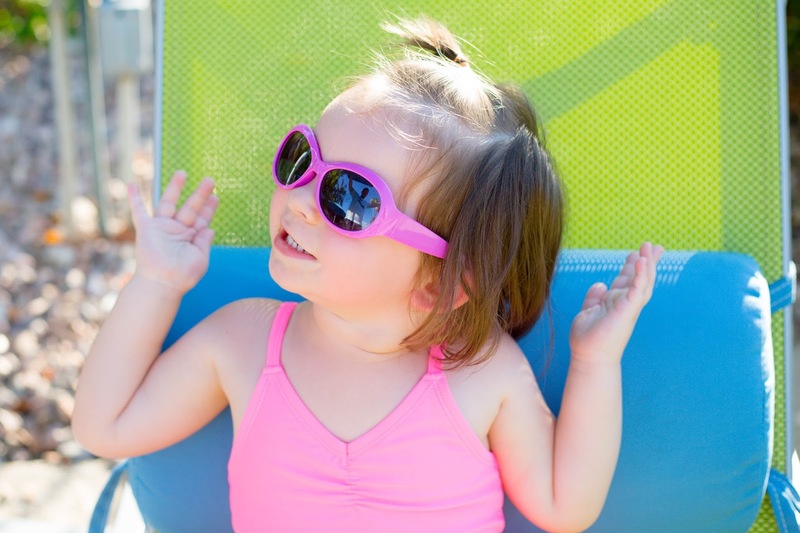 Tips for helping your children love the pool?